"Right before Bulgaria's entering the EU, this documentary serves as a presenatation of the human, natural, cultural and historical treasures of the the city of Plovdiv - the second largest one as well as the 'capital' of the French-speaking community in Bulgaria. It is a documentary presenting the creation of an identity based on a multi-cultural basis that has left trace throughout the milleniums of its development. 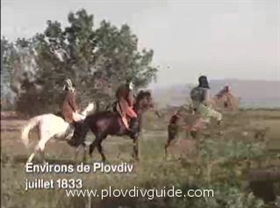 The leading thread of the story is the famous book 'Travel in the Orient' by Alphonce de Lamartine - the poet whose genius predicted the connection Bulgaria was about to have with the rest of Europe later on..." - that is the annotation of the documentary dedicated to Plovdiv. The film is called "From Macon to Plovdiv - a story of an art beyond time" (French title: "De Macon а Plovdiv, Pour un art hors du temps") and can be seen in five different languages: French, Bulgarian, English, German and Italian. It is going to be presented on the French channel TV 5, alongside with a 3-minute advertisement of the Old Town of Plovdiv running on the channel four times a day, starting April 1st). The film has been presented at the BG Embassy in Paris, and will also be presented at the BG Parliament on March 28th. The documentary will also be part of the on-board program presented during the overseas airflights of Air France.